On 16th January 2012, our member and friend Katerina Zlatnikova lost her battle with cancer. 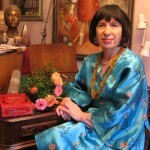 She was a talented and well respected cimbalom artist who is a sad loss to the dulcimer community. You can read about the details of her funeral on 27th January 2012 in Stuttgart below.